When I was in Paris this spring I enjoyed my walk in the Jardin des Tuileries. I noticed this group of chairs in front a fountain and they looked very cheerful and friendly. As I prepared to take a picture of them I looked up and saw the obelisk from the Place de la Concorde on the right and the Eiffel Tower to the left. Surprisingly (at least to me) the famous landmarks were not the focus of this picture. I really liked those chairs. Check here for more on the challenge. 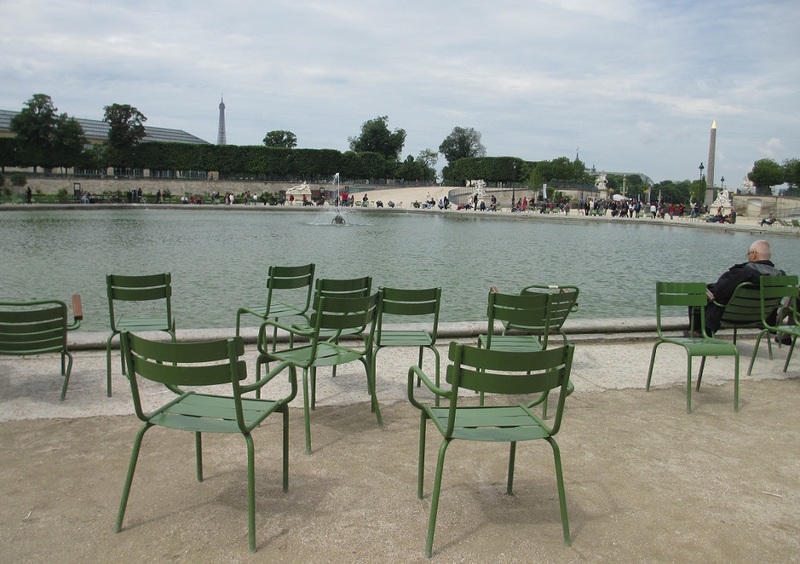 This entry was posted in France, Paris, Travel and tagged chairs, Eiffel Tower, Jardin des Tuileries, Place de la Concorde. Bookmark the permalink. Nice shot. I love the non-traditional view of the major landmarks, putting into focus real time…..interesting. Thanks – I never expected the Eiffel Tower to just be something in the background! Oh I long to go here! Great interpretation! Thank you and I hope that you get to go to Paris! Funny how the simple things really grab us. I can see why you like them. They are colorful and look extremely comfortable and attractive. I am with you on that. I find certain chairs irresistible and so charming that I want to have a pic of them. I really did like those chairs and they were very comfortable too! Pingback: Weekly Photo Challenge / B4 Retouch: Unusual POV (Paris Notre Dame) | What's (in) the picture? Pingback: Usually Hidden and From An Unusual POV | East of Málaga .... and more! It is very peaceful… That must be one of your favorite pictures from Paris! Great photos for this challenge! Isn’t great to have the perfect picture for these challenges? Nice choice. I see what you mean, those chairs do have a very friendly look about them. I’m glad they got the notice they deserved. Neat juxtaposition of the iconic and the everyday! Thank you, that is a wonderful way to describe the scene! Regardless of where you point your camera in Paris, you can’t miss! I love it all! :) Perhaps one day you will turn up down here in the south? I like the green colour of those chairs … very chic, very Parisian. I think that must be what I liked about them. They really do look Parisian! I was looking at that and thinking, hey that looks familiar, almost like in Paris. Yeah, I’m bit of a simpleton. I don’t think so – I’m glad the picture looked like Paris to you! I have something similar in Hyde Park, from many years ago. They had deckchairs beside the Serpentine and my small curly headed daughter was perched in one. It’s so often the unplanned and unexpected stuff that ends up being the highlight of our view, our day, isn’t it! That is so true and one of the best things about traveling!